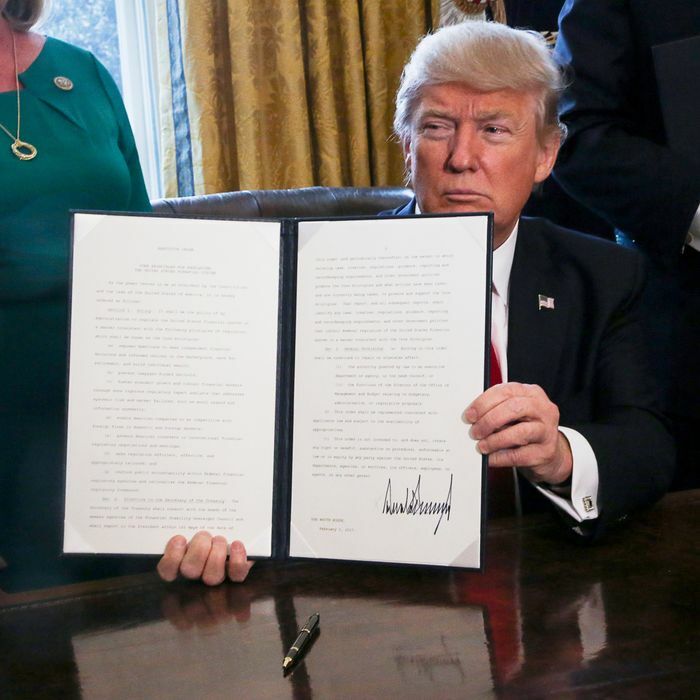 It took just two weeks into his presidency for Donald Trump to take aim at Obama’s chief piece of financial reform, the Dodd-Frank Act — that 2010 legislation aimed at creating a modicum of oversight and consumer protections on Wall Street. On February 3, Trump issued an executive order giving the Department of the Treasury a broad mandate of “empower” investors and issued a memo seen as a first step in reversing the fiduciary rule, which requires brokers to act in the best interests of their clients. Neil Barofsky, for one, saw this coming. Appointed by President George W. Bush to oversee the financial bailout as inspector general, he was a harsh critic of Dodd-Frank from the beginning — not because of its complexity, but because it didn’t go far enough. During a conversation at the law firm of Jenner & Block in midtown Manhattan, where he’s now a litigation partner, Barofsky weighed in on how Trump’s administration could defang Dodd-Frank in the immediate future, and what’s in store for the U.S. economy. Why have you always been so down on the Dodd-Frank financial regulations? I think what we’re seeing right now is the proof of the objections made by me and a lot of other reform-minded people back when Dodd-Frank was implemented. We warned about the limitations of taking an incremental approach, as opposed to just taking a meat cleaver to the banks and breaking them up, or using a size cap. It’s harder to put big banks back together again than it is to repeal, or scale back, or simply not enforce the rules. What did Dodd-Frank do? It put a tremendous amount of discretion in the hands of the financial regulators. There are a couple very obvious problems with that. One, it assumed regulators would get it right — that they’d be omniscient, and would be able to see around corners, in a way that the whole history of financial regulation demonstrated that they cannot do. Second, it resided on this presumption that future regulators would be of the exact same mind as those who were responsible for pushing through Dodd-Frank — that is, they would recognize that it was important to constrain big banks, and that it was important for there to be increasing capital levels, because of the implicit guarantees of too-big-to-fail. But obviously Tim Geithner and Ben Bernanke and President Obama were not going to be running the Treasury, the Fed, and the White House forever. All you need is a change in philosophy. And given the incredible power Wall Street has over Washington — I don’t mean bags-of-money corruption, but the ideological corruption, the campaign-contribution corruption — it was inevitable that the banks would be deregulated again. You don’t actually have to do anything to gut Dodd-Frank. You don’t have to apply this inane idea of “canceling two regulations for every new one.” You don’t actually have to pass legislation. You just have to appoint a bunch of people in these jobs who are not going to care. It’s like Dodd-Frank was more of a tool kit that any presidential administration could use at its discretion, not a series of structural reforms. Would that kind of reform legislation be reversible? Of course! President Hillary Clinton, too, could have brought back the deregulatory environment and allowed the banks to get back together again. But even that would have taken some time, and would have taken a filibuster-proof majority in the Senate and the House, and a full legislative process. But they didn’t do that. They regulated the banks in this technocratic way. Now, did I think the deregulation would happen so soon, that it would be so extraordinary, that we’d see so many people from the big banks filling in the regulatory apparatus? That we would so soon see a president turn to the CEOs of Wall Street and say, “If I need advice on Dodd-Frank, I know exactly where to go and get it”? Did I think that would happen so quickly? I wasn’t that prescient. But for those who fought so hard to keep more-meaningful reform from happening — the Tim Geithners and the Ben Bernankes and Larry Summerses of the world — if they woke up shocked to see that their entire experiment was a failure, shame on them, and shame on how captured they were in not making the big moves that needed to be made back then. Putting aside concepts like corruption, deregulation is just the philosophy. It’s a wrong philosophy, but this is sort of the free-market view of the world. To them, the financial crisis was all because of greedy homeowners and government-sponsored entities. And they’re wrong — they’re empirically wrong — but that’s their belief, and they were never shaken from it throughout the crisis. If you really believe the unrestrained, giant banks are good for the world, then here we go again. How do you respond when people say Dodd-Frank is too complex or has too many duplicative rules? Well, yeah. It’s too complex. It should have been two pages: “BREAK UP THE BANKS.” It could have been one sentence. I mean, obviously it couldn’t be one sentence, but they’re totally right. It’s too complex. The problems of Dodd-Frank are real: It did overregulate, probably, smaller financial institutions. It did increase the compliance obligations and regulatory burden on institutions that, in and of themselves, are not a threat to the financial system. That was a big political mistake. It probably did raise the barriers to entry and solidify too-big-to-fail banks as too-big-to-fail banks. There’s something to a lot of these individual criticisms. Boom, bust, bailout. That’s the cycle. There’s a good case to be made for bringing down each one of these very complicated and imperfect barriers, but when you start doing that and not replacing them with other sensible regulation to deal with the too-big-to-fail problem, you invite another crisis. Because, remember, banks are a lot bigger today than they were in 2008. Why do you think that, in the bailout period and when Dodd-Frank was passed, everyone failed to understand the importance of breaking up the banks? And, you know, Summers and Geithner and [Gene] Sperling were going senator-to-senator to lobby against Brown-Kaufman and breaking up the banks. It wasn’t that people didn’t know. A lot of people knew. And frankly, if the administration had wanted it to happen, it would have happened. So I look at Dodd-Frank as more of a political failure of the reform movement. I think if the reform movement had been better organized and more ready for that moment last time, it would have happened. I have no doubt that that is not going to be what holds it back next time. That doesn’t mean it’s going to happen, but as far as organization, as far as having thought leaders, as far as having the academic research — having all of that lined up — that’s not going to be the problem. What are the deregulatory measures immediately within reach for this administration that you’re most concerned about? Capital levels are the simplest thing to understand. Banks fund themselves — with capital and debt — so the question is: How much of their funding should consist of their own capital? In other words, when a bank makes money, what do you do with the money? Do you take the profits and give them out to your shareholders? Or do you hold onto some of it and fund your business going forward? When you invest in your business, you’re increasing your equity capital, so you’re relying less on borrowed money. And that way, when losses come, as they inevitably do in the business cycle, you have the losses come out of capital. So the more you have, the smaller a dent it is when you have losses, and when you run out of capital, you’re bankrupt. That’s what happened to Lehman Brothers. One of the things that Dodd-Frank has done, and regulators have done since then, is increase the percentage of the assets of a bank that have to be funded by capital as opposed to debt. So when you lower that, it means the banks will be more leveraged — they’ll borrow more and have thinner capital cushion, which means that when they have losses, they’ll be closer to failure. And the capital levels are under the discretion of the executive branch? Then you attack the bigger structural issues. You appoint as the Fed’s vice chair of banking supervision someone who doesn’t believe in banking supervision. Look, we did that. We did that with [Alan] Greenspan. We have a great experiment in this country of regulators who don’t believe in regulation. So, how do you think our regulatory infrastructure will look in four years? Do you think it will all be dismantled? It depends on what they do. If there’s any silver lining to all this, it’s that if all they do is nonenforcement, and they don’t take on the major changes in regulations, and they don’t make any legislative changes, then the next administration could dial it back. We could have this ping-pong depending on whether it’s a Republican or a Democrat. Things will get tightened a little bit more and become a little bit more safe. But ultimately, this doesn’t get fixed until the next crisis. And when the next crisis hits, we’ll just have to hope that the sanity of breaking up the banks has its day. That was one of the many problems with Dodd-Frank: It doesn’t lend itself to dramatic fixes. So either this administration will repeal Dodd-Frank, as the president has promised, or they’ll just attack certain provisions and not enforce — which I think is more likely — and then we’ll have another crisis, and we’ll see who’s in power at that moment to effect a breakup. So what should we expect next? Big short-term gains, and then — Yeah. Boom, bust, bailout. That’s the cycle. We’re now in a full-throttled boom, so people will make a lot of money, and then they won’t. Geniuses will figure out exactly how best to time this, so they’ll make a lot of money on the way up, but know when to get out and short, and they’ll become billionaires, and Michael Lewis will write another book about them. God bless them. I wish I could do that, too — wish I was that prescient. Last time around, the idea that got pushed out was that everyone who didn’t time it right was an idiot. Talking to people on Wall Street, it’s clear that everyone else was not an idiot. With the people who lost, it wasn’t necessarily that they didn’t know this was an unsustainable bubble. They just thought it had another year or two left in it. You look at the markets right now, and all the dumb money — from retail investors, for instance — is coming in right now, so that means it’s going to go up. But when is it going to pop? The guys who know that are the ones who become billionaires. What do you think is the best thing we can hope for during the next four years? My best hope is that the next crisis is not as severe as the last one, and that the political environment is such that, when it happens, we can finally make the deep structural reforms that we have to so we can avoid this cycle, and protect ourselves from the political cycle as well as the economic cycle. Maybe it happens in three years, and that sets up a wave of election of people who will make the necessary reforms. I mean, look: I hope it never happens. I hope I’m totally wrong, and it turns out that Alan Greenspan and the free-marketers were right, and we just go up, up, up, up. I’ve never been so hopeful to be proven wrong.